Decorative Arts & Home Furnishings Online Auction — Harritt Group, Inc. Selling online the eclectic lifetime collection of a late UPS Executive and his wife from their Asbury Park home located near Prospect and Springhurst. Nearly 400 lots including Gallopalooza Horse, artworks of world renowned artists including paintings, sculptures & glassworks, Persian hand knotted rugs, contemporary furniture & accessories, Waterford crystal, art glass, Asian home furnishings, turtle collection, clocks, garden decor & furniture, UPS memorabilia, mink coats, designer purses, books, kitchen & housewares. 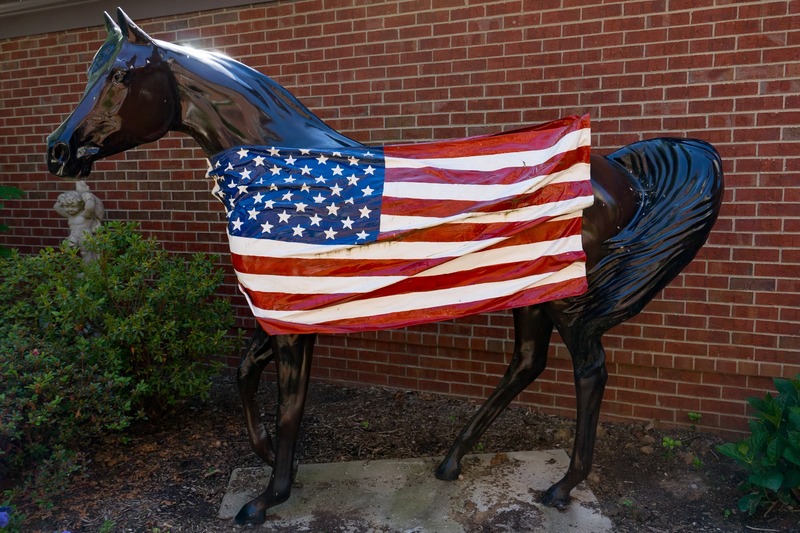 Lifesize fiberglass horse sculpture draped with American flag representing “Freedom” the 1967 Kentucky Derby winner, and a Gallopalooza book which it is featured in. Rare opportunity offered to the public. Contemporary designed pieces include dark lacquer buffet server with aluminum feet, & matching (6) lacquer dining chairs, burl walnut glass door corner cabinet, 72” (open) round wood dining table with perimeter leaves, English oak table/chair combination, Howard Miller grandfather clock cabinet, pyramid shaped curio cabinet, Pulaski curio cabinet, (3) blonde maple bookcases, lavender loveseat & ottoman, pair of aluminum bar stools, sea turtle glass top cocktail table, art deco style bar/display cabinet, (2) desks including Contemporary Gallery desk unit and frosted glass top desk, glass shelf display cabinet, swivel & occasional chairs, 3-piece Century bedroom furniture, retro dresser, accent tables on rollers, Asian teak wood includes 4 door display cabinet, pair of display cabinets, corner chair, plant stand and (2) garden stools, faux bamboo solid door cupboard, bamboo chair, pair of twisted wood carved tables, 15-drawer apothecary cabinet, (3) porcelain Jardinieres on stands, (2) ceramic garden stools & umbrella stand, iron trundle day bed, dresser, oak drop leaf table, 35” burl marquetry lazy susan and Panasonic reclining massage chair. Whimsical multi color blown art glass chandelier, contemporary stainless 24-branch starburst chandelier, Waterford Lismore brass 3-arm chandelier, Tiffany style reproduction table lamp, glazed ceramic table lamps, torchiere & art glass floor lamps and desk lamps. *Chandeliers removal at buyer’s expense by licensed electrician. 61” x 58” Original Rashid Hashim oil painting titled “Underwater Nirvana II Turtles”, Artist Proof giclee Wyland titled “The Mermaid & The Turtle”, Wyland cold cast bronze wall plaque turtle porthole, Wyland bronze turtle mirror, original acrylic David Dunlevy titled “Cape May Night”, numbered serigraph Christian Lassen titled “Voyage of the Ho’okulea”, Peter Max Eastern Europe Museum Tour American flag artwork, Ramsey Mapunde framed leopard print, Gus Butcher silk painting, Wyland North Shore print, Rafael watercolor, framed Cheverny tapestry, frameless acrylic models on canvas, Asian hand painted panels & textiles, Empress portrait, several Chinese peasant folk art prints, James Dean & Gene Autry prints & collage, Indian Royalty color print, (2) New York City numbered prints named “And Our Flag Was Still There” & “Whassup NY”, framed world maps, and others. Lorenzo Ghiglieri American Eagle bronze sculpture, (2) Dino Rosin, Italy 24” glass turtle sculptures, Anthony Atkins “Tranquil Glass” etched glass panel, George Bucquet art glass turtle console bowl, numbered Mark Hopkins sea turtle bronze sculpture, numbered double sea turtle sculpture, Ruth Brockmann “A World on a Turtle’s Back” art glass turtle mask, Charles Fazzino NYC apple sculpture, (6) hanging leaded art glass including turtle, American flag, geometric, amber, Geisha & turtle suncatchers, Matthew Lovein Raku wishkeeper, Jacobson Naked Raku ginger jar, beaded sea turtle, decorated wood carved African mask, plastique “Bag O” Sweets” by Pergola, cast bronze buddha, engraved hanging brass tray, decorated pyramid dresser box, piranha mirror & leaded glass turtle mirror, stone heart, artist display vases and bowls, and other sculptures. (14) hand knotted wool and silk rugs of various sizes and colors purchased from around the world. Large selection of Waterford crystal including John Rocha black vase, Spirit of America bowl, 6-piece John Rocha wine set, (10) vases, (4) bowls, sherbets, pitchers & carafes, stemmed glassware & tumblers, bar & table accessories, Christmas figurines & (40+) ornaments, 6-piece Nativity set, cross, candleholders, Times Square bell and paperweights, Tiffany 4-piece set of brandy snifters, Noritake Fitzgerald Service for 12 dinnerware, Happy Holidays Nikko Service for 20 dinnerware, selection of Belleek china, assorted leaded crystal, pressed and cut glass. Lalique Sidonie turtle, (2) Baccarat crystal paperweights, several Swarovski crystals including sea turtles, tortoises, tulip and others, (4) jeweled trinket boxes, (2) Herend Hungary porcelain turtles, (5) Limoge France trinket boxes, Steuben & Orrefors art glass sculptures, Lladro Sea Turtles porcelain figurine, Lenox turtle collection, colorful blown & clear glass turtles, Wade porcelain turtles, (7) Cloisonne’ trinket boxes, Netsuke turtles, Hungarian porcelain turtles, turtle collection of all materials including Jade, pewter, brass, wood & ceramic, (26) toy lead soldiers & military musicians, German beer steins, African didgeridoo & other musical instruments, chalet cuckoo clock, whimsical art clocks, Brownie Hawkeye camera in original box and Pentax ME 35mm camera, empty watch boxes include Rolex, Patek, Jaeger LeCoultre and others, 1983 Cabbage Patch doll, Longaberger baskets, unopened Jim Beam Bourbon bottle, walking sticks & canes, kaleidoscopes, Irish collectibles, Louisville Stoneware luminary and other pieces, Goebel “Home from the Market” & (2) Goebel Angel Christmas Candle Holder figurines, (3) pair Asian water carriers & figures, (10) ceramic tea light houses, whimsical children’s items, Bichon collectibles and more. 1988 Chinese silver Panda coin, (2) pair of salt & peppers, (6) napkin rings, serving spoon, small turtle trinket box, and Tiffany .925 cake server set. Yudofsky full length mink coat, Yudofsky sheared plum mink jacket, red suede and mink jacket, multicolor fur & faux jacket, (5) designer vests, (3) capes, designer purses including Mary Frances, Hobo, Coach and other whimsical small handbags. UPS framed needlepoint, (2) framed UPS jets, UPS model jets & delivery trucks, commemorative coins & unopened Maker’s Mark bottle, paperweights, mugs, desk sets, Tasco binoculars, key rings, books and more; Marine collectibles include Iwo Jima sculptures & prints, books, drink glasses, mugs, and more. Muller “Holy Story” pyramid, (20) Radko ornaments, Department 56 Halloween villages and other Halloween decor, Thomas Kinkade village Christmas tree, Danbury Mint New York sculptures, (25) Hallmark ornaments and others, Christmas yard art, figurines, and dishes, assortment of St. Patrick’s Day & Fourth of July decor. Cutco knife set, Newbridge silverware & knife set, International 28-piece Christmas dinnerware, teapots, set of 12 novelty shot glasses, set of 6 wine glasses African style, pasta dinnerware, bakeware, stainless cookware, Seltmann Weiden espresso cups, hand blown tortoise shell drink set, Fire-King Jadite batter bowl and other mixing bowls, Happy Apple Valley horse nut bowl, colorful entertainment dishes & platters, small appliances, Elmer Lee bourbon barrel lazy susan, portable heaters, air purifiers, towel warmer, Singer & Kenmore sewing machines, linens, large selection of books, TV’s, bamboo flooring, storage closet units, Marineland corner aquarium on stand, overflowing Fibber McGee’s closets and cabinets. Steel plate Fleur-de-lis park bench, aluminum bench, mosaic iron bistro set, Frontgate table & chairs, lifesize whimsical standing turtle, standing stainless steel wire turtle, enameled iron wall flower, 5’ tall iron sunflower, 8’ windmill, copper sprinkler, assortment of shepherd’s hooks and garden art, concrete cherub, Werner 6’ step ladder, Frontgate & Cosco aluminum step ladders, yard tools, Craftsman tool bench & tools, shop vac, stainless Tommy Bahama cooler and more. I-265 to Exit #34 Crestwood Brownsboro Road. East past Paddock Shops to right on Springdale Road. 1 mile to left on Asbury Park Blvd. to immediate right on Broecker Blvd.